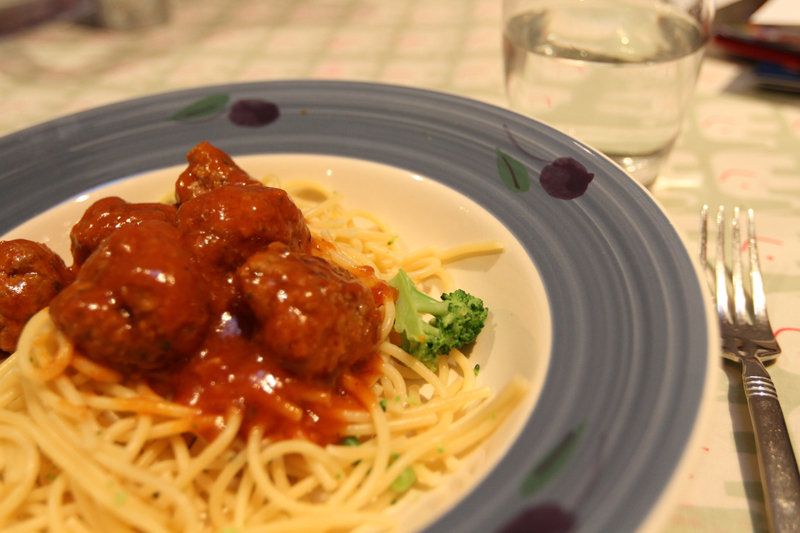 I know it’s simple but I do love spaghetti and meatballs. I made them the other week with a can of tomato soup (since I had run out of tinned tomatoes) and they turned out alright – two of us went back for more! half a small head of broccoli cut into small florets. Mix meatball ingredients together well using your hands and form into meatballs that about about 2 tbsp worth. Heat oil in fry pan and when hot, fry the meatballs, turning them regularly until you get some caramelisation all over. Pour in the tomato soup and water and bring to a simmer. Let simmer for 5 or so minutes and check the taste – add salt or sugar as necessary then leave to simmer until sauce has reduced to a saucy consistency (around 20mins I reckon). In the meantime, cook spaghetti so that it is ready about the same time as the sauce. Add the florets of broccoli into the boiling water with the dry spaghetti and although the broccoli is soft at the end, it works quite well because they kind of become part of the sauce. Add grated parmesan cheese to the ones who can have it. Notes: Pretty sure I didn’t put garlic in this recipe but I would add garlic just before the meatballs if I was using a tin of tomatoes instead, and maybe that would be good with the soup too – might have saved me adding more salt etc. Let me know if you try it. nice work Lib – Ellie LOVED them … she ate the same sized serving as me! That’s fantastic Jess! More tomato tolerance or did you use the no tomato recipe? ?